Conventional wisdom, which is very influential but almost entirely wrong, tells us that Coronary Heart Disease CHD is effectively self-induced, by eating the wrong foods in particular. The diet-cholesterol-heart hypothesis is challenged only by a few, who are considered to be heretics. In era of preventative medicine, the key to identifying individuals at particularly high risk of CHD is cholesterol screening. This works on the basis that a high serum cholesterol level is an indicator of cardiovascular death, but the evidence to support this is weak. Like all population screening exercises, the identification of high cholesterol will always produce considerable anxiety in the individual; it will always give someone something else to worry about. Before creating national or even international anxiety (and it is already too late) it is as well to make certain how useful the serum cholesterol level of an individual is for predicting the future – we need to look critically at its predictive value. The early work of relating serum cholesterol to future risk was undertaken using working men as the subjects. However only about 30% of those suffering from a heart attack fall into this age-group and the majority are above the age of 70 years. Is it reasonable to assume that what is found in middle-aged men is equally applicable to the elderly? I use the term stunned silence because this finding has received no publicity and has no practical impact whatsoever. Remember that about 90% of CHD presents after the age of 50 years. Think how many people above the age of 50 years have had their serum cholesterol level tested to try to predict coronary risk when it doesn’t. Measuring the serum cholesterol of middle-aged men cannot be expected to provide any useful information but it seems to be unstoppable, especially when doctors receive a financial reward. The relationship between serum cholesterol and survival has been investigated in a group of 92 women aged 60 years or more who were living in a nursing home in Paris . The women were selected as being free of cancer as it had previously been recognised that serum cholesterol is low in people with cancer. They were followed up for five years and it was quite clear that those with the lowest serum cholesterol had the worst survival. We can see in Figure 1 that the follow-up of people based on the blood levels of cholesterol. Here we are looking at the death rate. It is high, expressed as deaths per 100 women, as life expectancy is not good in such a group. However it is clear that the death rate is the highest in those with the lowest cholesterol, average 4.5mmol/L. The death rate in those with a serum cholesterol of 4.5mmol/L was five times that of the death rate in those with high cholesterol levels (8mmol/L). The relationship between death rate and serum cholesterol turned out to be what is called U-shaped, or J-shaped if asymmetrical, shown in Figure 2. The optimum serum cholesterol in this group of women was 7mmol/L, representing those with the lowest mortality rate, standardised as 1. 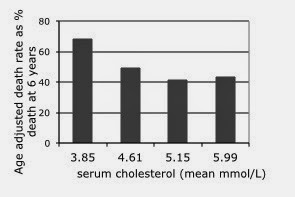 Those women with serum cholesterol greater than 8mmol/L had a slightly higher death rate. However those with lowest serum cholesterol had by far the highest death rate of all. It looks as though a cholesterol level of between 6 and 8 is ideal for women aged 60 or more. This is based on evidence and not dogma. We can see that the death rate, that is the risk of dying, increased with increasing age as would be expected. The important and unexpected fact emerging from the figure is the highest death rate in those with the lowest serum cholesterol; this is the elderly paradox. The other way to look at the same thing is to record the number or percentage surviving. The evangelists of the diet-cholesterol-heart hypothesis might argue that the reason for the high death rate in those women with low serum cholesterol is that they had or were dying from cancer, but this possibility was eliminated as far as possible at the start of the study. The authors comment that cancer mortality declines after the age of 70 years, and during the five-year follow-up during which 53 of the 92 women died, autopsy revealed cancer to be the cause of death in only one. Another interesting result, and again paradoxical, is that at the onset of the study the average serum cholesterol of women known to have CHD was 5.9 mmol/L. In those who were not known to have CHD, cholesterol was higher at 6.3mmol/L. A further study of the elderly was undertaken in New Haven, Connecticut . This was a community-based study of 997 persons aged more than 70 years with follow-up for four years. 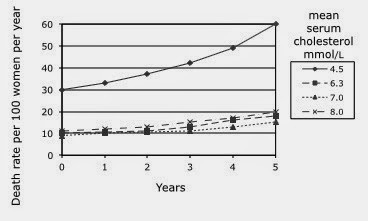 The CHD mortality was once again paradoxical in that a higher level of serum cholesterol was associated with a lower death rate (Figure 3). 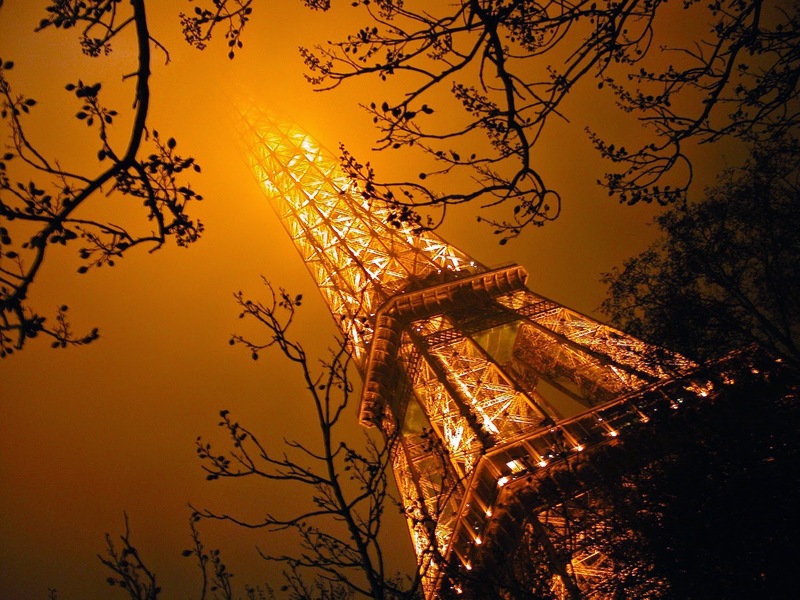 The women studied in Paris were in residential care and would have been frail with poor life expectancy (they would have lacked what is called "physiological reserve", not easily measured). Those studied in New Haven were not in supported care and the mortality rate was lower. However the important observation was that those with the lowest cholesterol levels had the highest mortality rates, again five times the mortality rate of those with the highest cholesterol levels. Over the age of 70 it is clearly an advantage to have a blood cholesterol level greater than 6.2mmol/L. A similar result came from the Honolulu Heart Program, a study of 3572 men aged 71 to 93 years. There are two ways of looking at the data. Rather than death rates, the Figures 4 and 5 show survival over a period of six years in four groups (quartiles) based on serum cholesterol. Those with worst survival were those with the lowest cholesterol levels, mean 3.85mmol/L, and this is another example of the elderly paradox. Those with the highest cholesterol level (mean 5.99mom/L) had the best survival. The results were unchanged when first-year deaths were discounted, the purpose of this being to avoid the possible effect of low serum cholesterol and death being due to undiagnosed cancer. Another interesting observation came out of this study. For the purpose of analysis, the subjects were divided into two groups, those with risk indicators of CHD (smoking, hypertension, diabetes or pre-existing manifestations of CHD) and those without. In both of these groups the mortality rate was lowest in those with the highest serum cholesterol. In those with risk factors, the risk of death for those in highest cholesterol quartile (mean 5.99) was only 75% the risk of death in those in the lowest quartile (mean 3.85). If we look at those without risk factors, those in the highest cholesterol quartile had only 56% risk of death compared to those in the lowest quartile. Clearly, in this age group above 70 years, low serum cholesterol cannot be regarded as a good thing. It is worth noting some of the statements and conclusions of the authors. It is difficult for medicine and society to absorb the observation that a low serum cholesterol is associated with a worse health outcome but the evidence is strong. The studies also indicate that there is much more to statin therapy than lowering serum cholesterol. If statins are to be given then the prescription should not be based on cholesterol measurements. There is no necessity to measure cholesterol levels in women and in men above the age of 50 – that is the benefits will not be for those tested, but for the doctors, the pharmaceutical companies and the academic departments that they support. 1. Anderson KM, Castelli WP, Levy D. Cholesterol and mortality: 30 years of follow-up from the Framingham study. JAMA 1987; 257: 2176-2180. 2. Forette B, Tortrat D, Wolmark Y. Cholesterol as risk factor for mortality in elderly women. Lancet 1989; 333: 868-870. 3. Krumholtz HM, Seeman TE, Merrill SS, et al. Lack of association between cholesterol and coronary heart disease mortality and morbidity and all-cause mortality in persons older than 70 years. JAMA 1994; 272; 1335-1340. 4. Schatz IJ, Masaki K, Yano K, et al. Cholesterol and all-cause mortality in elderly people from the Honolulu Heart Program: a cohort study. Lancet 2001; 358: 351-355. You must find all this so frustrating David that the general public just don't accept all this data. When I told her about the research you quote she just looks at me as if I was balmy! I'm late with this question, so perhaps you won't see it, but, here goes. In the research papers do they show the breakdown of the different types of cholesterol? 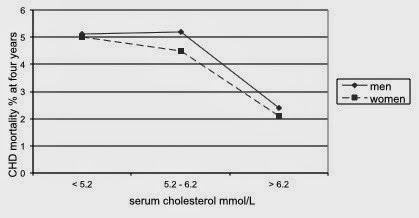 For example, is the drop in total serum cholesterol in older folks due to a drop in HDL levels, or something else? Hi Mickey - the studies measured total cholesterol, but this equates to LDL very powerfully. There are attempts to disregard total cholesterol studies with claims that LDL is more "up-to-date" and somehow more powerful. However the widely rested Framingham studies measured total cholesterol. We could call the observations the "Elderly Paradox". There is always the attempt to explain away a paradox such as this that does not fit in with current dogma, but perhaps the paradox is pointing to the truth. The cholesterol story is a house of cards.